Magnetisation is transferred from 1H to 15N via cross polarisation and then selectively to the 13Cα using specific cross polarisation. 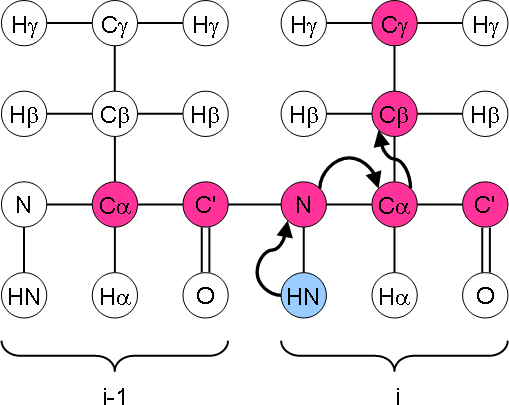 A DREAM step is then used to transfer magnetisation to 13Cβ nuclei further along the amino acid side chain. The chemical shift is evolved on the 15N and 13Cα nuclei and then detected on 13C, resulting in a 3D spectrum. A 2D version in which the 13Cα evolution time is left out is also possible. This spectrum is very useful for identifying amino acid spin systems and to some extent ‘decrowding’ the NCACX spectrum. The DREAM transfer is optimised for transfer from Cα to Cβ, but some Cγ will also become excited and be visible in the spectrum, because their chemical shifts are similar to some Cβ chemical shifts. Because the DREAM transfer is a double quantum step, the Cβ peaks will be negative and the Cγ peaks will be positive.